RCSWin can read in data from an HTRI Xist shell and tube design, reducing the time necessary to input the mechanicals for a design that has already been thermally rated. This is a very flexiblel module used to generating a complete estimate for a job. The estimating package is incredibly customizable to meet the needs and abilities of each fabrication shop, with literally thousands of individual labor operations built in. Generates both a cost estimate, and an hour by hour breakdown for the complete fabrication process. 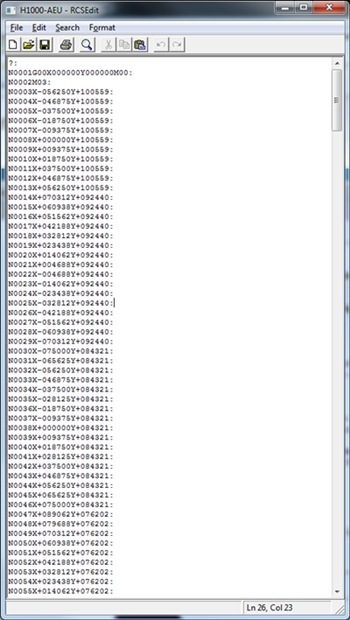 Shown below is a short output summary of an estimate. This module lets the user create inquiries and purchase orders directly from job data. Inquiries and POs can pull from any RCS job that has a valid bill of materials. The Inquiry / PO system lets each customer enter their list of suppliers and maintains their contact information for use on Inquiries and POs. 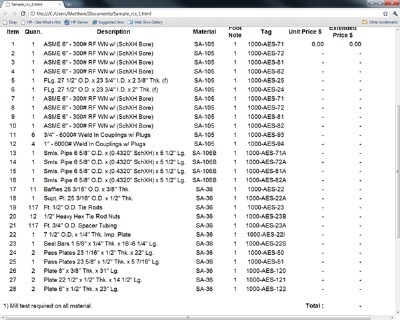 Items can be pulled from job files and added to an inquiry or PO by their bill tag, material type, or part number. In addition, a keyword search option is available to select specific parts. A sample PO (without pricing information) is shown below. 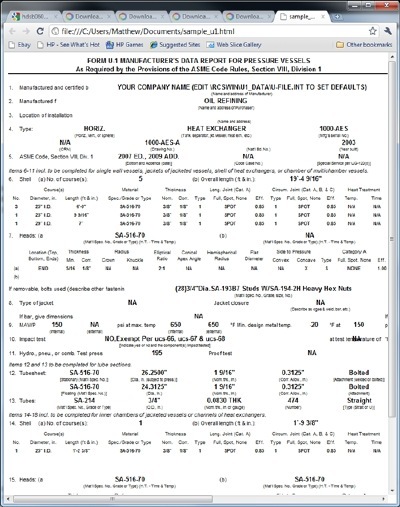 This tool generates the ASME U-1 data form for the current job. The report is generated in HTML format, and a sample is shown below. Individual stand alone modules for running quick calculations on cylinders, heads, tubes, and cones, including external pressure calcs. These individual component calculations can also be inserted into the job file for a full design. Modules for creating davit and hinge DXF files for export to AutoCAD. Kopp and Sayre method for calculation of expansion joints. L.P. Zick method for analysis of horizontal saddles. This program calculates nozzle projections, dimensions, etc. for exchangers that are on a slope. This program generates a CNC drill file for drilling tubesheets. 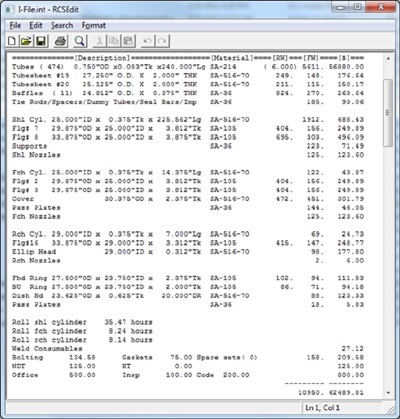 An example of the CNC data output is shown below. This is actually a pair of programs. The first generates the necessary data to create a cone from a flat plate, dimensions, etc. and stores it in a file. The second program is an AutoLISP routine run withing AutoCAD that reads this file and generates a drawing. This program creates a scale baffle drawing, including punching tube holes, tie rod holes, and dummy tube holes. RCS gives access to all ASME Section II Part D materials for use in all calculations, and also includes the ability to add other materials manually that are not defined in ASME.